This is really the BEST homemade Taco Seasoning recipe! It is full of flavor and is perfect for making tacos with ground beef, ground turkey, chicken or even adding to soups, dips, and more. This taco seasoning is a staple in our home and used regularly to add flavor to our meals, snacks, and appetizers. As a bonus it is gluten free, dairy free, and low carb without sacrificing any flavor, so it is perfect for many special dietary needs and perfect for entertaining. I have to admit, I used to think making your own seasoning was a waste of time since it was so easy, inexpensive and tasty to get at the store . Then I started reading labels, paying attention to unit prices, and tasting the difference homemade can make. Then I started making almost all of my seasoning mixes at home. I have made ranch seasoning, greek seasoning, fajita seasoning, and barbecue seasoning, but I have to admit that this taco seasoning might just be my most used of any of them in my pantry. First of all tacos are a staple for us. We love to eat them made traditionally or with pulled chicken and this recipe works well with both. Plus when you keep taco meat on hand, you can make so much more than just tacos. It is a leftover that reheats exceptionally well and you can dress up the leftovers into so many other meals so the time you spend cooking it can pull double duty into another easy meal for later in the week. Traditional taco seasoning, like this recipe, includes onion, garlic, chili powder, cumin, paprika, salt and pepper. You can use the amounts suggested below or play with the recipe to tweak it to bring out more or less of each flavor. Also if you get really creative you can add in other flavors to make a less traditional, but every bit as delicious seasoning. This taco seasoning is super simple to make with just a handful of spices you should be able to buy at any store. I am going to walk through a few tips here to hopefully answer any questions you might have. You can skip down to the bottom for the full printable recipe card. All of these should be readily available and easy to find in your local store or on amazon. You can make a large quantity of this and keep it stored in an air tight container for up to a year. Since it stays good so long, I like to buy the spices at wholesale stores and then make really big batches to keep on hand for cooking. 3 Tbsp dried onion- this will be the onion flakes not the onion powder. I prefer the way these incorporate flavor into the meat. 1 tsp smoked paprika- If you can’t find smoked paprika you can use regular paprika. All you need to do to make the mix, it to stir them all together! You can double or triple the recipe to make a big batch to keep on hand for cooking. I like to store mine in a mason jar in the cabinet so that it is airtight and is easy to spoon out into dishes to add flavor. I hope that your family enjoys this recipe as much as we do! Who knows, tacos may even become a weekly staple! It is easy and free of course! You can click here to sign up or on the button below. 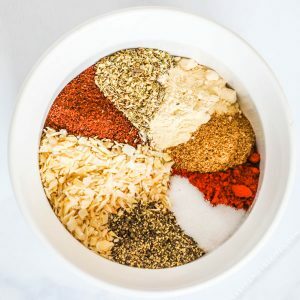 This homemade taco seasoning recipe is perfect for making tacos out of ground beef, ground turkey, or chicken. You can also use it to season soups, appetizers, or other Mexican inspired dishes. It is packed full of flavor and naturally gluten free, dairy free and low carb. This was the best taco seasoning! I’ve made several and they never have a similar taste to the packets that I grew up with and am accustomed to. So yay! Thanks for sharing! This was great! We’d stopped eating tacos because the pre-packaged seasoning was salty and gross, but this is perfect!